Finland has been producing quite a fair number of metal bands these days, some of which have established themselves as leaders of their respective genres - Sonata Arctica, Stratovarius, Amorphis, Children of Bodom, and many others. In terms of symphonic power metal, the Finns seem to have cornered the market. Unlike the Italians, who've recently been churning out band after band of uninspired power metal, those from the Frozen North seem to possess something a little unique that sets them apart and brings a bit of freshness into a saturated field. 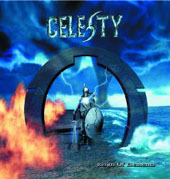 Celesty joins the crowd with their debut album Reign Of Elements, a very solid display of thundering metal with many similarities to Sonata Arctica and Stratovarius. With just one listen it's clear that the masterful keyboard work of Juha Mäenpää is what lends Celesty their distinctiveness. Very much a part of every song, the outstanding melodies are at the forefront and tend to stick with you. The band as a whole is tight, explosive, and technically remarkable, with singer Kimmo Perämäki performing well within the expectations of this genre. "Revenge" and "Sword of Salvation" are two highlights of Reign Of Elements, with Jani Liimatainen of Sonata Arctica guesting with a solo on the former track. Both of these songs have wonderful keyboard melodies - not the neo-classical swooping kind that one normally associates with the genre, but more subdued and memorable. The only real weak point I could find on the album was the voice-acting in the title track and "Sword of Salvation". The songs are not enhanced in the least bit, but thankfully the frantic tickling of the keys by Juha and the blistering guitar runs of J-P Alanen and Tapani Kangas keep these songs from descending into mediocrity. Fans of the European symphonic metal being churned out in superb form by the Scandinavians would do well to get their hands on Reign Of Elements as it is a worthy addition to any collection. Indeed, even those wishing to experience a well-played introduction to the genre would be satisfied with this album.